The situation in California is bordering on ridiculous. Something has to be done to close the $41 billion budget deficit, but thanks to the inability of Republicans and Democrats to agree on a solution, nothing is happening. This stalemate has been going on for sometime now, and even after a 3o hour meeting this weekend they still can't agree on anything. The state is getting close to disaster and the parties need to figure out how to make this work. Tim Iacono looks at the situation more in depth in his blog post below, and even proposes a solution that might help light a fire under the legislators. Could there be a better image than the one below from this LA Times story to symbolize the state of the California State legislature? 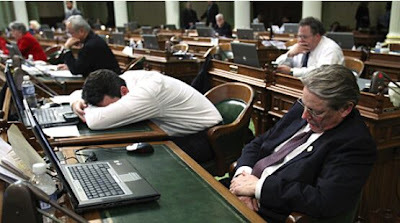 Apparently, they were up all night trying to get a new budget bill passed in order to close the gaping $41 billion deficit, but they were not able to produce the desired result. The proposed plan is about an even mix of spending cuts and tax hikes, but the Republican minority doesn't seem to like the tax hikes much and, since budget bills require a two-thirds majority (which the Democrats don't have), nothing gets done until a few Republicans get on board. In a situation that is not all that different from the U.S. Senate where a couple Republican votes are required to remove the filibuster threat, it is those few lawmakers from across the aisle that become all powerful. In California last night, Democrats came up one vote short of getting the three Republican votes needed to get the job done so they are set to resume talks at 11 AM today. In a bid to build pressure on balky Republicans, Schwarzenegger was ready to launch the notification process that could lead to the termination of 10,000 state workers in coming months, according to budget negotiators. "That is a very real possibility," said Aaron McLear, the governor's spokesman. The termination notices were intended to be sent Friday, but the governor delayed them because a budget vote appeared imminent. They really ought to just stop paying elected officials on the first day after a new budget is due and it hasn't been passed. A hit to the pocketbook can work wonders. 1. Strip all subsidies for programs benefitting illegal aliens - $13 billion per year saved. 2. Eliminate all premium pay for overtime and cap civil service wage and benefit packages at $150,000 per person, $90,000 for non-supervisorial personell. $4 billion saved. 3. Reduce all prop 13 in-lieu subsidies to local agencies by 250% and sunset the balance over the next three years - if voters in affected areas want the affected services they can approve increases locally. $20 billion saved. This is $37 billion of the needed $42 saved. With this done finding the other $5 billion should be relatiuely simple - maybe then some of us would even consider a fee increase. Until then, do your job legislature! There is no budget crisis in California: there is however, a crisis in leadership. The failure of our politicians to do what needs to be done is the reason for the popularity of constitutional referendums in California that often only tie lawmaker's hands when they attempt to solve multi-faceted issues with balance and compromise. It's a vicious circle. No amount of tax or fee increases, spending cuts or federal stimulus will solve California's budget problem. So long as we have the two party system what we'll need to get the people's business done is leadership. What we need is a California Barak Obama. Even with our problems, I would much rather be in California than Kansas (also broke), or Detroit (hell hole) where I grew up. California's roads aren't paved with gold like they used to be but its still better here than any of the other 47 states I've been in. The State of California should consider selling tax liens to investors on properties with unpaid taxes (Florida); or redeemable deed sales with a flat penalty (Texas). Straight deed sales will not cut it in a depressed real estate market like there is in Stockton and other places in California.